Back: Hidden Valley Ranch Mini Keg - One Year Supply! 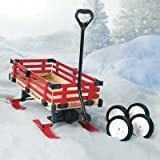 With this cool new Wagon Sleigh from Millside Industries you can pull the little ones around all year long because it converts from a garden wagon with no-flat tires to a sleigh with sled ski runners in minutes. Yep, it pulls just as easily on the ground in the summer as it does over snow in the winter. 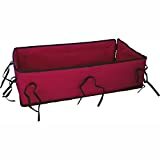 It features anti-tip steering, an extra long handle for easy pulling, a heavy duty undercarriage, and can also be ordered with a half canopy with a removable weather shield too. Hmm, if I was still a kid, I would pre-load this thing up with a mountain of snowballs and pull it to the snowball fight for a most certain and devastating victory.